How to wipe Memory Stick data? Selling your Memory Stick without erasing the data properly lead to threats of personal data leak. To safeguard your data like scientific reports, financial reports, personal photos, confidential data, etc. You need to overwrite your data with some other garbage data several times, so that your data cannot be restored. 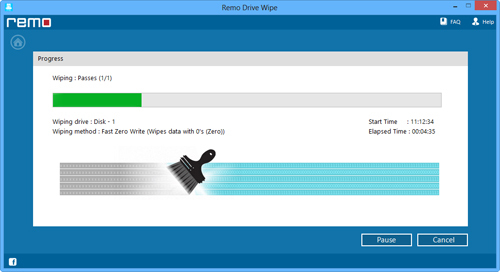 Memory Stick Wiping tool is a software that does this job flawlessly. It uses nine different sanitization processes to wipe the data beyond recovery. It uses following methods to wipe data Fast Zero Overwrite, Random overwrite, Peter Gutmann secure deletion, US Department of Defense (DoD 5220.22-M), North Atlantic Treaty Organization-NATO standard etc. It overwrites data with selected shredding patterns from 1 to 35 times. It works with Sony and other brands of Memory Sticks like Memory Stick Duo, Memory Stick Pro, Memory Stick Micro, Memory Stick PRO-HG, Memory Stick Micro M2, Memory Stick, etc. It works with Memory Stick on windows 2003, windows 2008, vista, xp, windows 7, etc. 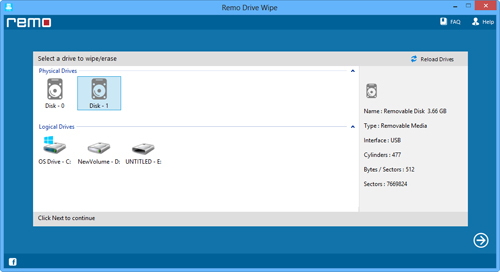 It offers many methods to wipe data from external HDD of different brands such as Seagate, Maxtor, Buffalo and so on. It can also be used to wipe memory cards, hard drive, SD cards, a single logical drive, external hard disks, etc. Perform mentioned below steps for wiping personal files and folders from your memory stick:. Step a: Download and install Memory Stick Wipe in your computer to wipe memory stick data. connect the Memory Stick to computer.select the Memory Stick from the logical drives. click "next"
Step b: select any one of the nine sanitization method and click on "Next". .